Next week, I headed to Seattle for a couple of days of events around my book, “Measuring the Networked Nonprofit,” co-authored with KD Paine. I’m doing a session for the NW Philanthropy and have been asked to talk a little about how to design peer learning and trainings for nonprofits. Having trained nonprofits on every continent of the world (except Antarctica), I had a great laboratory to develop my instructional design and delivery skills. One of the biggest challenges is keeping nonprofits engaged. Keeping nonprofit audiences engaged during training can improve your outcomes. People pay attention more, they learn something, they retain it better, and there is a better chance of them applying what they learned. There are many creative ways to engage participants at a training – both face-to-face and online. One technique is to incorporate movement – from mini-stretch breaks, to self-assessment exercises to switches in the delivery model. Movement can also incorporate what you’re training on. The photo above is an interactive self-assessment exercise that I did at a recent training for United Ways of California CEOs at a retreat at Yosemite. They took a self-assessment related to the topic of the training – the assessment gave them a score and they lined up according to their scores. Then we had a discussion to pull highlight and discover different practices. I used this exercise right after lunch to avoid the after lunch energy drop and use the time for instruction. Last month, I participated in the day-long convening of funders at the Media Impact Forum. (Storify here). I kicked off the morning session with a discussion on measuring impact with colleagues from VolunteerMatch – Greg Baldwin and Jay Backstrand. Later in the morning, I facilitated a large group discussion hour-long discussion right before lunch with Greg and Laura Efurd from ZeroDivide. Listening to the conversation and watching the audience for signs of energy drop, I inserted some movement into the discussion related to the topic by asking them to do the “failure bow.” This helped shift the energy and energize. 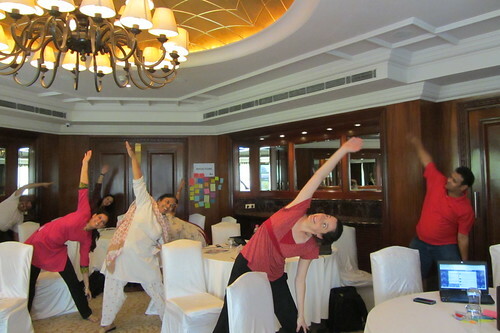 I was in India this past summer to facilitate an intensive four-day training for Packard Foundation grantees working on family-planning issues. The curriculum covered a lot of territory on social media and online collaborations, but every day after we came back from a delicious Indian meal, the after-lunch slump would set in. I planned for this by incorporating an after-lunch energizer that used movement to get people’s brains going. Energizers are activities designed to awaken a sleeping audience or activate a jaded one. Energizers are typically done right after lunch and during mid-afternoon breaks, when energy tends to be low, but they can be done any time. The energizer can be connected to the content or just a movement exercise or stretch. In India, I designed the first one to celebrate the local culture: It was called “Bollywood Moment.” I asked colleagues from India what was the most famous Bollywood moment was, and they mentioned the well-loved movie, “Chaiyya Chaiyya.” So as participants came back from lunch, I had them do Bollywood dance moves. And to make it more fun, I awarded prizes. Other times, I simply made them stretch like the photo above. It totally changed the atmosphere of the room, and people were ready to learn. I had different energizers planned for after lunch on each of the training days. On the last day, we made use of the beautiful three-story double staircase by having participants do a couple of laps up and down the steps. I try to incorporate movement in every training or speaking engagement I do. Of course, you have to modify depending on the physical space available, time of day, culture of the group, etc. Last November, I was the end of the day keynote at the Social Good Brasil Conference after a long day of presentations on the stage. When I got on stage to deliver my keynote, the audience looked they were all ready to fall asleep. I made them do some stretching, including a stadium wave because we were in a 1,000 seat auditorium. I had to do this through translator do, but it worked. There are many creative ways to have people move around while learning in training beyond stretch breaks, icebreakers, and after lunch energizers. Movement can also be integrated with the topics. For example, after you divide participants into small groups to work on a project, you can have them create wall posters and then do a walking-around debrief. Or speed-geek, which is similar to speed dating. I saw this image from the I Love Science Page that is a spoof on what is happening in the brain when someone isn’t learning. I suspect the same sorts of things happen when you are doing a powerpoint monologue or long lecture without any movement, interaction, or holding all questions until the end. This is not learning – and I dare say that it isn’t healthy for folks either to be sitting so long. As a facilitator, speaker, or trainer, when in doubt get them to move. That was my big takeaway from Sharon Bowman’s “Using Brain Science To Make Training Stick.” Movement does not distract learners – although some audiences are so formal and stilted they aren’t use to moving and the initial discomfort to asking them to move can make you believe otherwise. When participants move, oxygen to the brain increases, thereby enhancing both learning and memory. People can’t be as focused on content when they been sitting longer than 10-20 minutes. What was some of the best training you’ve ever experienced? Did it incorporate movement or other alternative methods? If you are a trainer or capacity builder, what are some creative ways you have infused movement into your training sessions? Absolutely love the “Your Brain on PowerPoint” cartoon. Thanks for sharing these great training tips. Great article I am going to share with my my local IABC Business Communicators chapter here in Trinidad and Tobago. Sharon Bowman created some great material. Between you and her, I’ve learned tons this past year! Thanks for talking about the importance of engaging learners when in person. Jeanne: I love Sharon’s work!! Mark, let me know how you apply this in Trindad and Tobago — I suspect there are some cultural dances that you can incorporate! Beth, couldn’t agree more! At my team alignment workshops, I will begin with an energizer that is also related to a teaching moment around teamwork. I find that this filters out the noise that is usually in everyone’s heads and helps them to get focused. I absolutely love your idea of doing these throughout sessions and will definitely use them as well. Thanks! Some of the best workshops I have attended have been within my own organization–Playworks. Thankfully over the past several years, I have learned great training techniques from my coworkers and have been able to use them in my own workshops. – We play active games that are a metaphor for a real concept, then debrief the game so that everyone can make relevant connections to their own work. It’s not always possible, given the format and the audience, but I find, especially in classes, that having participants/students/attendees interact with each other (moving their bodies, often, to face others or cluster differently, but also their brains, as they have to produce some content or at least some reflection, in addition to receiving it) helps even more than movement alone. I want people to get out of the receptacle of information mode, so I try to get them to present or share as quickly and as often as possible.